Sign up here for the Cato Book Forum on “Climate of Extremes: Global Warming Science They Don’t Want You to Know” on Thursday, March 12, 2009 at 12:00 PM (Luncheon to Follow). The Forum features “Climate of Extremes” coauthor Patrick J. Michaels, Senior Fellow in Environmental Studies at the Cato Institute with comments by David Legates, Delaware State Climatologist and Director of the Delaware Environmental Observing System. 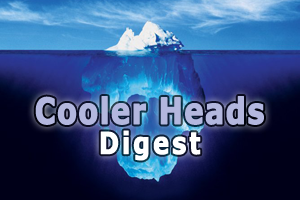 The Cooler Heads Coalition and the Science and Public Policy Institute will sponsor a briefing by Joanne Nova and David Evans on Friday, 13 March, from noon to 1 PM in 406 Senate Dirksen Office Building. Nova and Evans are prominent global warming skeptics in Australia. RSVP to Julie Walsh at jwalsh@cei.org. The Cooler Heads Coalition and the Science and Public Policy Institute will host a talk by Christopher Monckton (third Viscount Monckton of Brenchley) titled “Global Warming Apocalypse? No!” on Monday, 16 March, in 1334 Longworth House Office Building, from Noon to 1:30 PM. Lunch will be served. Rsvp to William Yeatman at wyeatman@cei.org. RSVP here for “An Update on the Science, Economics, and Geopolitics of Global Warming,” featuring Christopher Monckton, Chief Policy Advisor of the Science and Public Policy Institute, and hosted by Ben Lieberman, the Heritage Foundation’s Senior Policy Analyst for Energy and the Environment. The event will be held at noon on Wednesday, March 18th at the Heritage Foundation. At Junkscience.com, CEI Adjunct Scholar Steven Milloy reports that Senator John Kerry (D-Mass) said “the best” climate regulations would fail to stop “catastrophic and irreversible climate change.” While we can all agree with Mr. Kerry that climate regulations are useless, his alarmism is unfounded. After all, it hasn’t warmed in almost a decade, despite a steady increase in greenhouse gas emissions, and now the Discovery Channel reports that scientists are saying it won’t warm for another 30 years. Darren Samuelsohn and Ben Geman reported today in Environment and Energy Daily (subscription req.) that Senate Majority Leader Harry Reid (D-Nev.) confirmed in an interview that he planned to wrap cap-and-trade legislation into a larger anti-energy bill and try to bring it to the floor before the end of the year. The larger bill would include, most notably, a renewable portfolio standard for electric utilities. Reid had said several times in the past few weeks that cap-and-trade and other anti-energy provisions would be brought to the floor in three separate bills. His reversal puts the Senate on the same track as the House, where Rep. Henry Waxman (D-Calif.), Chairman of the Energy and Commerce Committee, has convinced Speaker Nancy Pelosi (D-Calif.) to put all the energy-rationing legislation produced by the several committees of jurisdiction into one big bill. There are differing views of what this means for the prospects for enacting cap-and-trade. My own view is that cap-and-trade is sinking fast and that putting it into a larger bill might make it slightly easier to pass. A team of prominent European promoters of energy rationing and global warming alarmism came to Washington this week to speak at a conference on Capitol Hill, give briefings to members of Congress, and meet with Obama Administration officials. They included Former British Prime Minister Tony Blair, Yvo de Boer, the head of the UN Framework Convention on Climate Change, and Edward Miliband, the UK’s climate minister. No doubt they explained how well the European Union is doing reducing its emissions while maintaining economic growth. The current economic downturn is already so severe that emissions probably are falling rapidly, which means that many EU countries now have a chance of meeting their Kyoto targets. As I told the Washington Post, the only thing that’s been demonstrated to reduce emissions is economic collapse. Capitol Climate Action held a “massive” anti-coal protest in front of the Capitol power plant on Monday. Six to seven hundred people, most of them university students, marched down the street and shouted while the snow fell. The Capitol Police were out in force, and the organizers’ intention to provoke them into arresting the demonstrators was not realized. About thirty of us gathered on the sidewalk right next to the Greenpeace truck and trailer (yes, sad to say, but Greenpeace prefers motorized vehicles to bullock carts) for a counter-demo to Celebrate Coal and Keep Energy Affordable! The Greenpeace truck had a big solar panel, but it was covered with three or four inches of snow, so they had to run a generator instead to power the PA system. A number of groups belonging to the Cooler Heads Coalition besides CEI were represented at Celebrate Coal!, including the National Center for Public Policy Research, Freedom Works, and Americans for Prosperity. Also attending were Ann McElhinney and Phelim McAleer, the Irish film makers whose new documentary about global warming, Not Evil Just Wrong, will premiere in the next month or two. In terms of comparing our per capita carbon footprints, most of the Capitol Climate Action protesters were university students who flew to Washington for the protest and also to attend the Power Shift 2009 conference last weekend. Most of us took the subway and a few walked to our Celebrate Coal! rally. Unfortunately, House Speaker Nancy Pelosi (D-Calif.) and Senate Majority Leader Harry Reid (D-Nev.) wrote a letter to the anti-coal zealots last Friday announcing that they would direct the Capitol power plant to switch over to run entirely on natural gas. This will increase the cost of the electricity and heat used by the Congress substantially, but I guess the only people who might care about that are taxpayers. “Bali” would be the “Bali roadmap” that the Bush administration agreed to as a parting shot. Was this merely some cheeky move by Bush to leave his successor with a pickle? No. It’s a double standard. The first confirmation of this was found within weeks of the election, when UN officials said that of course Obama wouldn’t be held to the standard to which Team Global Governance had–sometimes with extreme nastiness–held the Bush administration for eight years: you must sign on to a global warming treaty now or the world will end and you killed it . . . and, well, you know the rest, if you weren’t living on an island somewhere, enjoying a nice warm climate during the Bush-era global cooling…. Arizona State Representative Andy Biggs (R) this week introduced a bill to remove Arizona from the Western Climate Initiative, a regional cap-and-trade energy rationing scheme. Seven states and four Canadian provinces have agreed to participate in the WCI, but Rep. Biggs wants Arizona to withdraw because it would increase energy prices for consumers. According to a study by the Western Business Roundtable, the WCI would cost the average family $2,300/year by 2020. Governor Jan Brewer (R) has since said that Arizona will continue to participate and that the legislature must approve the State’s participation in a cap-and-trade. California State Senator Bob Dutton (R) this week introduced a bill that would delay implementation of AB 32, the Global Warming Solutions Act. AB 32 mandates a 20% reduction in greenhouse gases by 2020. Like all greenhouse gas reduction policies, however, it is designed to raise the price of energy, and Senator Dutton argues that expensive energy policies are unwarranted at a time when the state’s unemployment rate is above 10%. The Maryland State Senate passed Governor Martin O’ Malley’s Greenhouse Gas Reduction Act this week. The bill mandates steep greenhouse gas reductions that would result in a net economic benefit for the State’s economy. Of course, that’s impossible, because the “solution” to climate change is expensive energy, which is a job killer.